Our philosophy is to create the healthiest and safest environment for our animals. Our free range rotating system and small herds allow our animals to have the best life and care. Red Angus: Shorter and stockier than cows bred for dairy production, our Red Angus beef cattle have never even tasted grain. They graze on fresh pasture every day during the warmer months and eat hay harvested from the Mountain School campus all winter. We expect four calves during March and April of each year. Sheep: Our twenty-three Romney-Leicester crosses provide a good mix of meat and wool. The sheep graze rotationally with our cows until the first major snowfall. Fall semester students help with herding and electric fencing, while spring semester students are on hand for shearing (early February) and lambing (March). In a typical year we see thirty lambs by the end of April. Laying hens: With over ten breeds sharing the same space, our chicken barn can be a very colorful place. The hens have a big job: providing enough eggs for the daily needs of the kitchen plus the huge brunches students cook on Sundays. Many students say that collecting eggs every day is one of their favorite chores. Besides grain, the hens enjoy eating bugs, weeds, and kitchen compost. Meat chickens: Three hundred Freedom Ranger chicks arrive in the mail in the late spring and are raised on pasture in moveable shelters. Besides benefiting from the fresh air and access to fresh grass, birds raised in this way fertilize our hay fields with their manure. Our meat chickens are all male and look more like linebackers than like the other chickens on campus. Pigs: One of the highlights of the spring semester is the arrival of twelve squealing piglets from a neighboring farm. 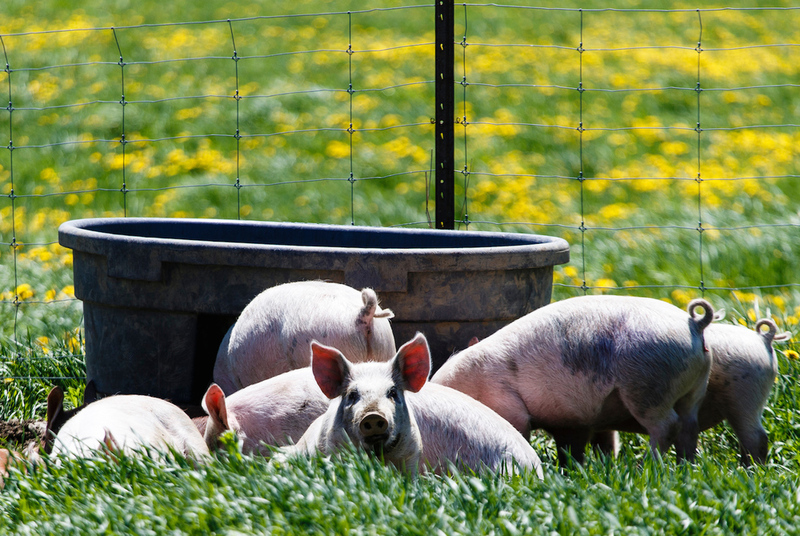 As soon as the cows go out to pasture, the pigs take over their area of the barn—an arrangement that allows the young hogs access to the outdoors but also plenty of shade and sunburn-protection. Besides grain, the pigs enjoy eating grass clippings, kitchen scraps, and whatever else their sensitive noses might find in the mud. Turkeys: Fall students who stand at the turkey fence and whistle may be rewarded with the response of 100 turkeys at once. Like the meat chickens, our Broad-Breasted Bronze turkeys are raised on pasture in moveable shelters. They are the stars of the Harvest Feast in early October. Desmond the Guard Llama: Desmond was a new addition to the Mountain School staff in March of 2014. His job is to protect the sheep from coyotes and other predators—a goal he accomplishes primarily by sounding the alarm if any canine gets too close. He is always gentle with people, but a coyote rash enough to attack one of the sheep would quickly find out what it’s like to be stomped by a llama.